Founding father of VoxVote is Vincent van Witteloostuyn, 20 years’ experience in data collecting and market research. Headquarters is in the Breda, in the south of the Netherlands, and research and development is done in Chandigarh India, you can read more about the coding ninja's on our team page. VoxVote is unlimited and free to use for your first 5 events, where you can ask 10 questions per event. And if you want more, you can buy more credits that will never expire, for a price that can't be compared to others in the market. We are 80% cheaper compared to other suppliers, and 500% cheaper than renting clickers or other voting hardware. (Stemkastjes, abstimmanlagen, voting boxes, infrared, SMS, Text Voting). Vincent, internet veteran, started VoxVote, his 2nd startup after 12 years working within the 2nd largest market research company of the world (GfK - Grow from Knowledge), so he knows everything about security, reporting and interview techniques. 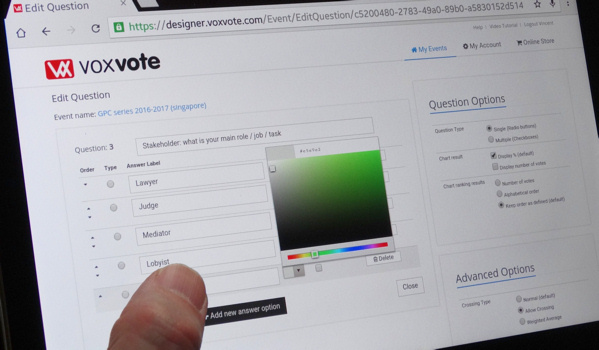 VoxVote combines the best possible features you can imagine in an audience response system, and we are proud to offer a unique feature: The event summary with all voting results that the speaker can sent to all participants. Vox has many meanings, but all sound, voice, vote related. Vox Populi is a Latin phrase that literally means voice of the people. In broadcasting, Vox Populi is an interview with members of the general public. 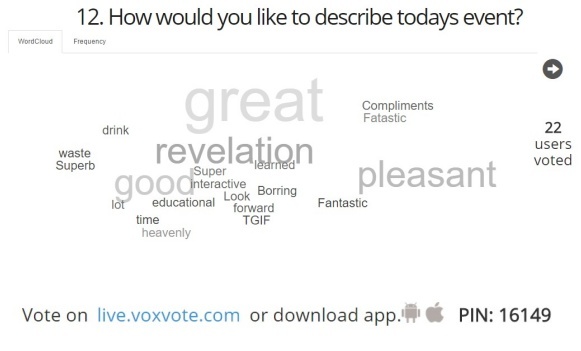 And a combination of interviewing and voting results in the VoxVote name. We have nothing to do with brown animals ‘The Fox’ or the FOX network, we are VoxVote with a V. (FoxVote - did you mean VoxVote the mobile voting app?) This V can also be found in the initials of our founder Vincent – VvW – and are integrated in our logo as well, en passent created by accident by Vincent 6 year old daughter playing with Kapla wooden sticks. 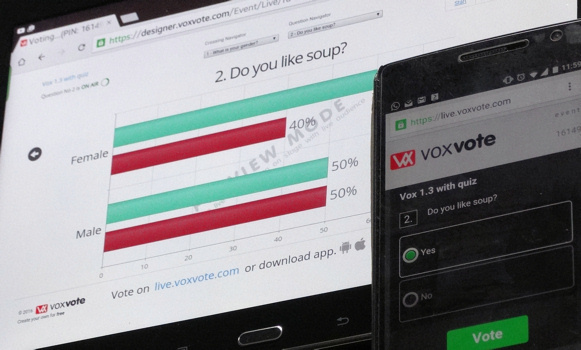 The VoxVote platform is freely available for end users who are in the audience. Voting app can be found on http://live.voxvote.com and in the app stores. More information our website https://www.voxvote.com or on facebook and twitter. We run on Azure, the Microsoft scalable cloud platform, located in Europe. We callit VaaS (Voting as a Service) on a SaaS platform. Try it and make your first vote. This example event can be used. You can use a smartphone, tablet, or the screen on the right of the live results.